The White House: All options in the Syrian crisis continue to remain [on the table] including the imposition of a flight inhibition zone over Syria. [Opposition] activists: Doctors inform on the running out of oxygen in the Syrian town of Qusayr and call for help in the evacuation of the sick and the wounded. 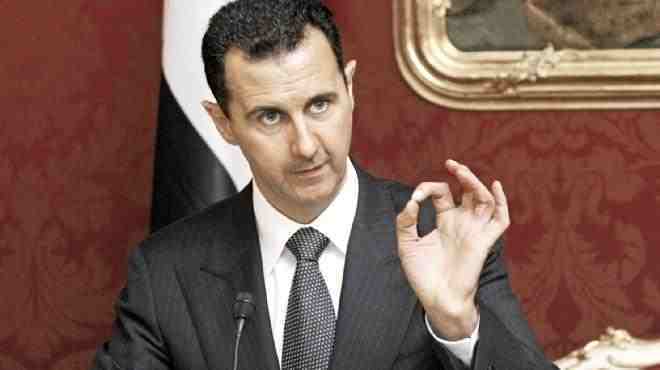 and which is regarding an approach of the Syrian regime. 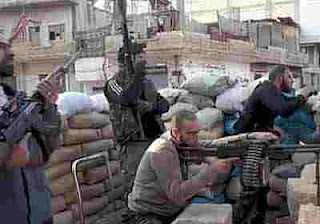 The human rights organization [subsidiary] to the United Nations is obliged to appeal to the Syrian regime [on the role of] foreign combatants during military operations. Russia determined to supply Syria with guided missiles. Female Syrian reporter died after being hit by a bullet. 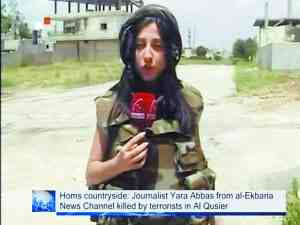 Syrian state TV journalist Yara Abbas who died in Qusayr. The war in Syria has passed another step. It has become "chemical". Toxic gases provoking cases of suffocation and even death have been employed by Syrian regime forces against, both, the rebel army and civilians. This is the new military tactic of a power ready for everything. It is being applied in numerous places and did not stop to intensify since April. Victims are experiencing cruel harm, the symptoms resembling those of poisoning with Sarin. Such information, now revealed by Le Monde, has been directly reported from the area. Our reporter Jean Philippe Rémy and the photographer Laurent Van der Stockt secretly travelled in Syria for two months. They carried out investigations in great detail, particularly in the region of Syria's capital Damascus. What they are reporting doesn't come neither from videos posted on the internet by the Syrian opposition nor from stories told by refugees, the usual source of evidence on chemical attacks in Syria these last months. For the first time, chemical attacks are described by Western journalists, direct witnesses of the incidents. The application of chemical weapons has been described by President Obama and other Western leaders as a "red line" the crossing of which would trigger off an intervention. Not later than May 24, F. Hollande declared in a speech to high-ranking responsible military personnell in Paris: "Today, the conflict has reached an extent that compels us, together with our allies, not to exclude any option whatsoever if the use of chemical weapons is well confirmed." Let us be clear about that: Le Monde doesn't hold [back] irrefutable proof of revertings to chemical weapons in Syria. Only a scientific expert's report based on test samples could establish without any shadow of a doubt the [proof of] an application of substances that are particularly forbidden by the convention of banning chemical weapons (1993). Not every toxic gas is a chemical weapon. But the use of a toxic substance in battle makes it quite certainly a weapon. One question is imposing itself: If journalists succeeded to make local investigations, how could be explained that Western leaders, considered able to control the data of their intelligence services, had never formulated until now any clear conclusion on the application of toxic weapons in Syria ? They restricted themselves to speak of "serious elements", just as U.S. secretary of state John Kerry recently did. Bashar al-Assad makes a profit from it. The absence of external reactions, apart from recent Israeli [air] raids, encourages him to go even further. After the tanks, the planes, the Scud missiles, now the chemicals. One can be sure that a conference considered to be prepared in Geneva would bring to live even more deceptions, if "Chemical Bashar" (*) thinks to gain ground from gassing the enemy. The conflict is counting nearly 100.000 casualties, the war extending its metastasis into the region. Are we to wait for a "Syrian Halabja", a massacre to be compared with that committed in Iraqi Kurdistan in 1988, before a real line of limitation will be traced ? The investigation of Le Monde is showing that it is urgent for those responsible in the West to clearly announce what they know about chemical [weapons] in Syria, such making them stop evading that "red line" and making them leave ambiguity before it's too late. Russia condemns a recent EU decision to arm Syrian rebels and says it will deliver S-300 anti-aircraft missile systems to the Syrian regime, despite objections from the U.S. and Israel. This could transform an already brutal civil war into an East-West proxy fight. 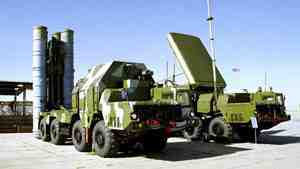 Israel, meanwhile, threatened to strike such air defense missiles systems if delivered to Syria, portraying them as a threat to the Jewish state and raising the risk of regional conflagration. Read the entire CBC article ! Financial Times: The role of Hizbollah in Syria deepens separatist [or: confessional] tensions in the region. The British journal "Financial Times" considers the role of Lebanese Hizbollah in the Syrian crisis [as effective] to deepen separatism and regional tensions in the territory, particularly after their [local importance] has definitely risen from one day to the other. The king of Jordan appeals for an end of "dangerous" separatism in Syria. In his brilliant address at the inauguration of the [proceedings] of the global economic circle for the Middle East and North Africa in 2013 (Davos) and which is related with the Dead Sea region (45 km west of the Jordanian capital of Amman), the king of Jordan said it seemed impossible to avoid an urgent political solution that would end the dangerous separatism in Syria. A circle of almost 900 leaders from the Gulf states, the Middle East, North Africa and other countries has met for debates on " major challenges that are facing such spheres like unemployment, poverty, transparence and inequality of income, the development of private sector and infrastructure ". The foreign ministers of the U.S., Russia and France are holding talks in Paris on the Syrian subject. Talks between U.S. secretary of state John Kerry, Russia's foreign minister Lavrov and their French colleague Fabius are scheduled from May 25-27.
after mounting the boat was to dismantle the positioning system. On May 20, China's Global Times used the above headline to report on an incident that should have happened during the night of May 5 when North Korean navy stopped the "Liao Pu Fish 25222", a Chinese fish trawler from China's Liaoning province, and detained its 16 crew members. At least 8 times the North sent a telegram to the Chinese ship owner pressing him for handing over at least 600.000 Renminbi [i.e. Chinese Yuan] as a "penalty". If this shouldn't happen before noon May 19, the fishing boat would be confiscated while the fishermen would be repatriated. 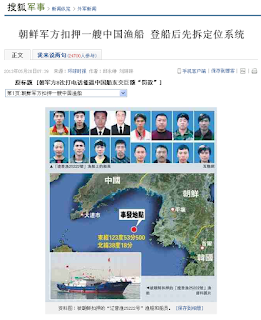 China demands North Korea to explain the incident of the detained ship. Robbing part of the ship has caused much attention. Above picture: Captain Yu Xue Jun during an interview granted to the Global Times on May 21.
the Pacific region and North America. ... when an enemy confronts you angrily for a long time without either joining battle or leaving his position, then you must watch him with utmost care. North Korea to bring about a highest degree of change. It's about the visit of Kim Jong Un's special envoy to China who arrived yesterday, May 23, and declared the goal of his visit being to "improve and consolidate" Chinese - North Korean relations. Hizbollah Attacking Rebels in Syria. Regime forces simultaneously shelling al-Qusayr during continued engagements between the Free Army and Hisbollah elements. of the Assad regime [what constitutes] the bad news for Israel." Within two days North Korea launched four short-range guided missiles. Japan and South Korea are speeding up their [counter measures]. According to South Korean media reports from May 20 [and] following the launch of three controlled short-range missiles towards the Eastern Sea region of the peninsula, North Korea again launched one short-range missile towards that sea region. According to an analytic evaluation, North Korea's activity of continued missile launches is probably part of military exercises. After the incidents occured, Japan and South Korea speeded up their counter measures. On [May] 19, United Nations Secretary General Ban Ki Moon [already] called on North Korea to stop [further] missile launches and return to the six party talks. 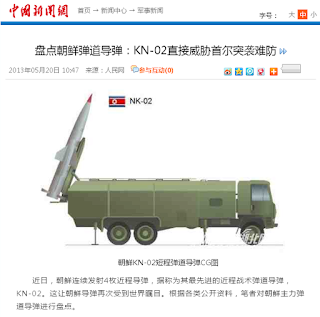 Another Chinese publication is dealing with North Korea's KN-02 missile that was tested in the above mentioned launches. The KN-02 had been developed on the basis of a Soviet SS-21 missile. Its range is about 120 km. The KN-02 is a direct threat in a [pre-emptive] surprise attack that is difficult to guard against. Bashar al-Assad denies that his forces used chemical weapons and refuses to step down. Today, Syria's president Bashar al-Assad denied that it was his troops who used chemical weapons against opposition fighters [while] refusing to step down in an interview with an Argentinian news [service]. As to the origin of the Nairobi request for my blogspot on Syria using chemical weapons, I have some second thoughts. Did this request really come from Kenyan authorities or rather from the nearby Iranian embassy which might use the same internet access. The below picture is proving that Iran is very much interested in Syria. 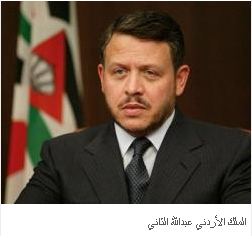 It shows an article published by Al-Arabiya on April 28, 2013, dealing with a meeting of Iranian president Ahmadi Nejad and Egypt's president Morsy for a discussion of the Syrian crisis. The Epoch, a pro-Western Chinese news service operating from a U.S. server, has the news of a so-called "Syrian Electronic Army" that invaded Twitter sites of some Western media and organizations. The Syrian hacker troop declares it acts in favor of Syria's president Bashir al-Assad. Yesterday, May 17, The Financial Times FT, London, became their last target when Syrian hackers left a remark on FT web locations saying the "Syrian Electronic Army Was Here". Earlier attacks were directed against the British daily The Guardian on April 24 this year and a BBC weather report where hackers announced some kind of "catastrophe" to hit the people of Israel. Another site attacked was that of Human Rights Watch organization. The French news broadcast of France 24 suffered as well from being invaded by the Syrian Electronic Army. U.S. media calling Russia's providing guided missiles for Syria a "psychological provocation". North Korea appointed [Zhang] Jong [Nan] 张正男] to become the new defence minister. Third change of defence minister within one year since Kim Jong Un assumed office. The new defence minister should be in his 50s which is rather young in comparison with his predecessor who is now slightly above 70 years old and kept his office for eight months. 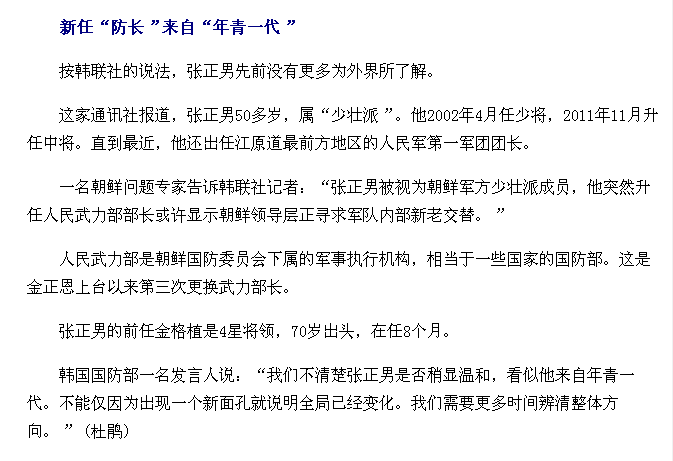 The new minister is therefore considered as belonging to the "young generation 年青一代" or the "young and vigorous group 少壮派". 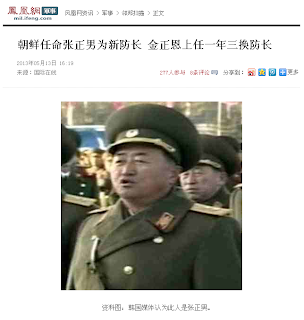 After his appointment as a "young general / young militant 小将" in April 2002, he finally became lieutenant general in November 2011. "Let him die another day !" South Korean media exposing the inside of a North Korean military factory. 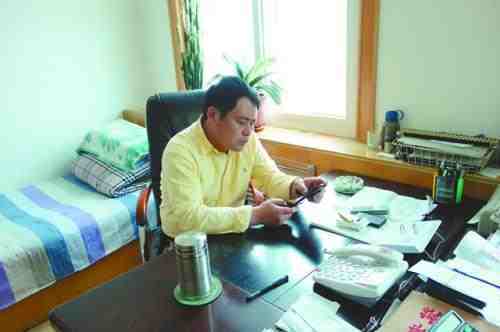 A North Korean is said to have taken some [video he sold for money]. A U.S. special envoy for the North Korean question will leave for a visit to Asia in the second half of the week. The envoy is expected to visit South Korea, Japan and China for talks on the North Korean issue. Japan's defence minister says promotion of U.S. troops in East Asia is sensed capable to deter North Korea. On the occasion of U.S. aircraft carrier Nimitz reaching the coast of South Korea for joint U.S. - South Korean naval exercises, the Japanese minister of defence made his declaration in favor of U.S. troops in East Asia. In the frame of these exercises, the U.S. aircraft carrier battle group will be using a seaborne aviation wing (CVW) and a seaborne combat group (CSG). [Flagship USS Nimitz] is accompanied by USS Princeton [CLV-23, a light aircraft carrier] and other ship(s) equipped with the AEGIS combat system [a sophisticated early-warning system] while the South Korean side has deployed its 7.600 ton AEGIS-equipped destroyer "Sejongdaewang" together with another 5.500 ton destroyer. Both, U.S. and South Korean AEGIS ships will be primarily engaged in missile survey and anti-submarine exercises. 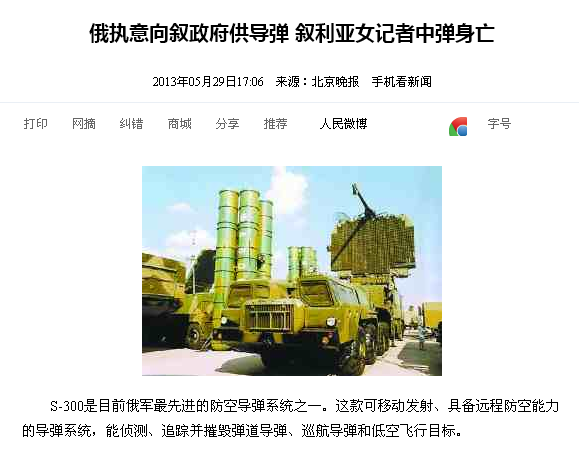 Bank of China closed North Korea's foreign trade accounts. The above message has just been published by Reuters Press Agency on its Chinese news site. Obviously they had to change their main headline perhaps because of a fresh news trend. 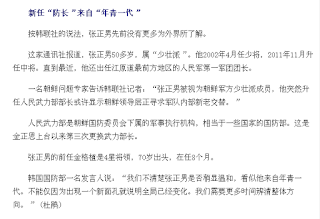 The original information seems to have come from the Chinese edition of Wallstreet Journal (picture below) published some hours earlier. That website was infected with a virus and could not be downloaded immediately. If severe loading problems of the Reuters site were related to a virus attack as well could not be verified. Regarding the message itself, it must be pointed out that the Bank of China finally took action as had already been demanded by the U.S. and their allies. 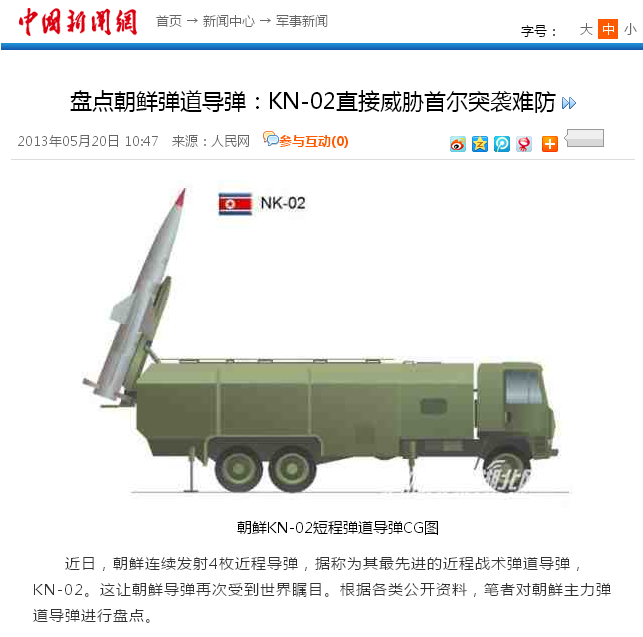 A comprehensive foreign media report from May 7 informs: South Korean and U.S. intelligence organizations are saying that North Korea already withdrew a Musudan [brand] guided missile from its launchpad. This might signify that the North abandoned an earlier "state of attending military operations". Above: The picture under today's headline (regarding the withdrawal of a Musudan missile from its launchpad) is showing Kim Jong Un while visiting a national research institute for biological engineering on May 6, 2013. Park (*) meeting with U.S. defence secretary - Reaffirming joint efforts to keep threats from North Korea's guided missiles within limits. Facing a U.S. - South Korean series of manoeuvres, North Korea many times advanced vehement criticism. The North Korean National Defense Council even more expressed [their view] that if the U.S. and South Korea stopped their manoeuvres [and] U.S. national defence abandoned sanctions while simultaneously apologizing to North Korea, North Korea could enter into talks with the U.S. and South Korea. Otherwise, if South Korea is all along hiding under America's "umbrella of nuclear protection", there will be "death without any doubt". On May 7, the North Korean People's Army [added]: If U.S. - South Korean troops begin a provocative shelling, the North Korean army will immediately strike as well. If suffering from a counterattack, everything available to the rocket unit(s) of North Korea's People's Army in the south-western front regions will be deployed in an immediate operation, such turning South Korea's neighbouring islands into a "sea of flames". and says this would be South Korea's "prelude to war". A splendid mixture of localized visitors to "blueprint news"